"Working with Payless has helped our company look good with our clients! " Are you a service company? Click on the "More Info" link to see a view of the services that we offer to help you! We are certified as a HUB Minority Company for government, educational and corporate projects. We work with Heating & Air Conditioning, Plumbing, Electrical, Home Inspection, Foundation Companies and Residential Customers. We come in and take care of damages that occur through air condition or plumbing leaks, cracks on walls, ceilings due to foundation problems or homeowners have provided us with home inspection lists to complete. We also, work with companies when they do heating, air conditioning, electrical or plumbing installations and they need to remove walls, attic stairs, sheetrock cutouts or when one of their guys just comes down through the ceiling where there is no opening. We use our expertise of being able to do carpentry, drywall, paint and matching existing colors and textures. When we are called upon to take care of these accidents or work with these companies, our focus is to treat their customers with the utmost respect, provide quality work and assure them that no one will ever know that any damage has ever occurred. In turn, customers are happy and remain loyal to their contractor company. 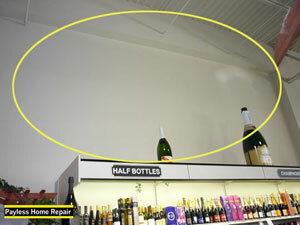 Commerical location had cracks and drywall damage on the wall over the refrigeration unit. Drywall was replaced and paint was matched perfectly to existing color to appear as if nothing happened before! Feel free to contact us with any questions or to schedule an appointment! © Copyright 2010-11. 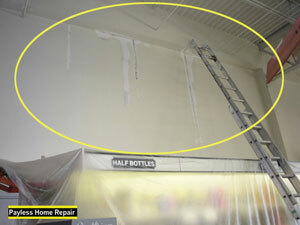 Payless Home Repair. All Rights Reserved.